Do you think artists should connect with their fans via social media or leave up the wall between performer and audience? Personally, I think that it is the artist’s choice. If they are not comfortable with interacting with fans then they should keep it to a minimum. I love it when I hear from people that I admire on Twitter or Facebook; however, the interactions are genuine. Who wants their favorite celebrity to act fake when they are talking you one on one? No one does. Fake is just icky. 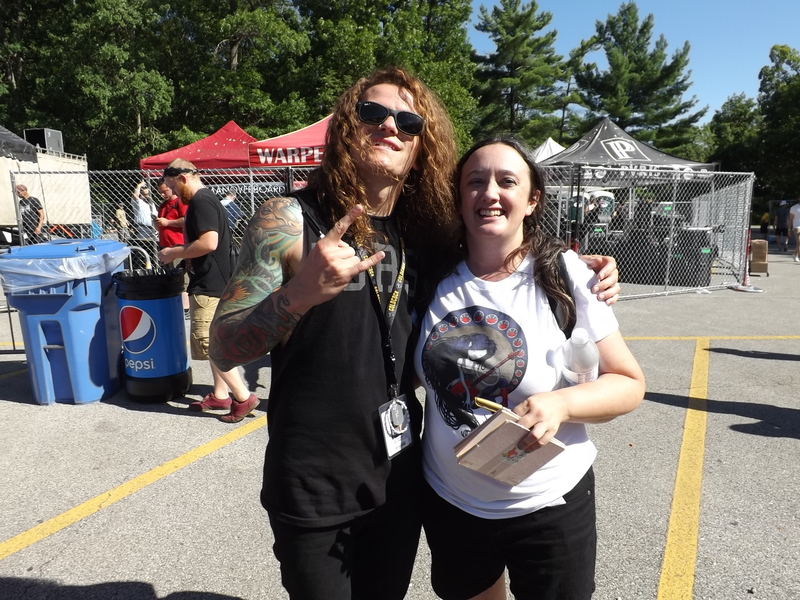 Levi Benton of Miss May I and I. This guy from Miss May I keeps it pretty real. He was so nice about signing my pink autograph book. He even commented on how many signatures are in it. At last count, I think there are at least 25 but I’ve had it since 1983. You’re so right about keeping it real. When I went to Dragon*Con (a geek convention in case you didn’t know). I met up with Lou Ferrigno, whom I loved as a kid from The Incredible Hulk and even though I paid to get his autograph and no one else was in his line, he acted like I was wasting his time. Like, damn, dude, why even be there? At least Brent Spiner made it pretty clear he was only in it for the money. ^_^ Just kidding, he was a good sport about it. oops, forgot to close the italics! sorry! Some people are really cool about signing autographs and taking pictures. Others are not. Surprised about the Hulk though. I agree. Different boundaries for different people; some actors sacrifice major fame for privacy but still do well enough, quietly. It’s about what you want to get out of things. Conversely, just because I have my twitter open to the worlddoesn’t mean that everyone needs or deserves to know everything else I don’t post about. It’s all balance and whatever we can live with, right? Great shot – nice dude. Thanks. Photo by Lucas. My boyfriend.